Cancer Fight Organisation Chairman M. S. H. Mohamed organised a fundraising project worth Rs. 1,000 million for the cancer hospital in Maharagama, recently. The MoU in this regard was signed between Cancer Fight Society and Director of the Health Department along with the launch of the fundraiser, at Colombo with the participation of Health and Indigenous Medicine Minister Dr. Rajitha Senaratne. The fundraiser aims to buy equipment to the Apeksha Hospital. 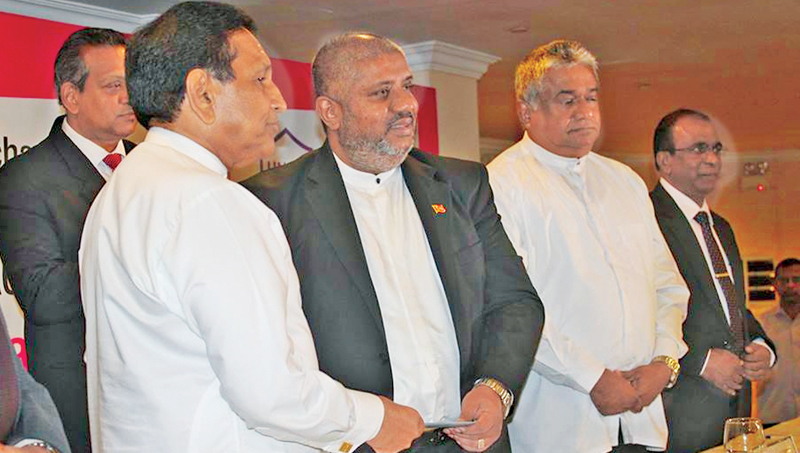 State Minister Faizal Cassim, Health Department Director General Dr. Anil Jayasingha, Maharagama Cancer Institute Director Dr. Vasantha Dissanayake and Cancer Fight Society members were present. At present, the Maharagama Cancer Institute has facilities for basic diagnosis, surgical management, Radiotherapy and chemotherapy management. “Even though we have facilities for 934 beds, we serve more than 1,000 inward patients and another 1,000 patients from the Out Patient Department (OPD) and clinics on a daily basis,” the Cancer Fight Chairman said. At present, patients who need this facility is referred to the private sector at Rs. 1 million for each case. Therefore, underprivileged patients are unable to afford the private sector. “Three years ago, I would not have even thought becoming a frequent visitor to the hospital. But now, the reason for my frequent visits is my son,” he said. “The medical expenses at some of the world’s most advanced hospitals cost me several of my properties too. But circumstances forced me to obtain additional treatment from the government hospital at Maharagama,” he added. “During one of my routine counselling sessions provided by qualified doctors for relatives of patients, he was shocked to be informed that the only government cancer hospital in the country lacks Motheraphy and Linear Accelara linac machine. It is one of the most vital tools that doctors use to continue the treatment accurately. Without a PET scanner and Motheraphy machine, the treatment is only guess work,” he said. If patients in Sri Lanka need Motheraphy, they have to go to a private hospital in Colombo which would charge Rs. one million per test and treatment. This unfortunately means that 99 percent of cancer patients in Sri Lanka are not in a financial situation to afford a Motheraphy scan at a private hospital. “Determined and motivated by the hospitality and generosity of the hospital staff, I pledged the doctor that I would bring a Motheraphy machine to the hospital. The doctor asked me whether I knew the price of the scanner to which I replied in the negative. I learnt it costs around Rs. 1,000 million,” he said. “This made me more determined and resolute. We believe that with many generous and empathetic people here, we could gather them and donate a Motheraphy to Apeksha Hospital. With several milestones already achieved towards this goal, we feel a great and unexplainable sense of satisfaction. A tiny drop of joyful tear you see from a cancer patient is worth more than a mere Rs.1,000 million,” the Chairman added. Mohamed advised those who go for treatment overseas that they should first visit this hospital and check the quality of the service. You would find it in par with international standards. You can save millions of rupees from wasting them overseas. “It is our duty to support and upgrade it to an even better standard,” he said. He made an appeal to the 200 million people living in the country to contribute at least Rs. 50 for the purchase of Motheraphy and linear accelerate linace machines.